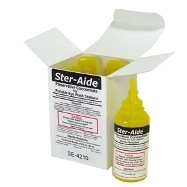 Speakman Ster-Aide Eyewash preservative is a highly concentrated solution and can be used to treat eyewash stations from 6 gallons to 20 gallons. It comes in cases of four 2 oz. bottles. TEMPORARILY DISCONTINUED BY THE MANUFACTURER!